Like it or not, we are currently in the grip of what has become known as the ‘fourth industrial revolution’. Just as steam once transformed industry, now data and artificial intelligence (AI) are revolutionising the way we work. And for some, the changes this will bring will be stark. A recent report from the Office for National Statistics (ONS) has predicted that 1.5 million people in England are at high risk of losing their jobs to automation. According to the report, 70% of the highest risk roles are held by women, with part-timers and the young next most at risk. 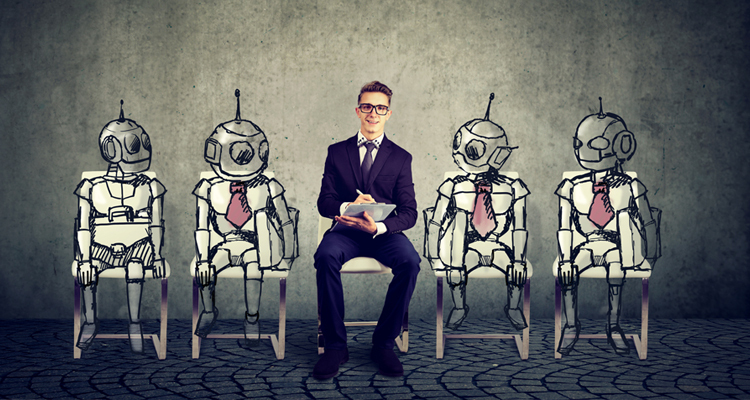 These are startling figures and whilst we shouldn’t expect robots to take over all of these jobs immediately, it is unsurprising that such predictions are having an unsettling effect on many – particularly, it seems, HR professionals. A recent survey of 1,000 employees across UK businesses employing more than 500 people, conducted by CENSUSWIDE on behalf of Xexec, revealed that AI was deemed to be the biggest concern for HR practitioners, with well over a third (38%) identifying it as the primary factor likely to disrupt their jobs in the future. If it is now inevitable that the increasing adoption of AI in the workplace is going to create challenges for HR and reward professionals, as well as many other industries and professions, it may be time for you to reflect on what your businesses can do to mitigate the impact. And there are really two factors to consider here: firstly, the longer-term risk of job losses, and secondly, the short-term impact on morale as employees become increasingly concerned about their futures. Let’s look at the shorter-term implications first. It is likely we will see more news stories such as those that followed the recent ONS report highlighted above and it is probably wise to expect that this could increase a sense of fear amongst many – particularly those at highest risk of being impacted, such as women, lower-skilled, younger and part-time workers. There are unlikely to be many businesses that don’t employ people who fall into these categories and it is therefore important to be aware that some of your workforce could increasingly feel less valued and recognised for the skills they bring to the business. Knowing that this could have a real impact on employee engagement, it is important to identify where this may be occurring and take measures to ensure that staff do feel recognised and valued for the important role they play. This is where reward and recognition comes in, as small gestures of kindness and gratitude can make a really big difference. If people feel like they are being treated as robots, they are much more likely to fear that they will be replaced by robots. Responding to your staff as individuals and rewarding their unique achievements via reward and recognition programmes, can really help re-motivate disillusioned employees, ensuring they remain invested in their jobs and career development. For, if someone feels that their role will be replaced by a machine in the coming years, it’s hard to imagine why they would continue to work hard at becoming better at it – what’s the point if the skills they are learning may soon become redundant? Of course, it is important not to gloss over the reality that many roles will gradually be replaced by technology and addressing this early on can help mitigate the potential impact on your workforce. Being honest with yourself and your staff about which jobs are most at risk gives you and them time to plan for the future and enables people to start to adapt in order to ensure that they remain employable. Looking at the HR profession specifically, it’s important to consider which aspects of the HR role are most likely to be replaced and which are not. Technological developments may mean that many of the tasks that the HR function has traditionally managed will become automated, but there are some key parts of the role that cannot easily be done by a machine. After all, the profession is called human resources: it is first and foremost a human role. Talent attraction and retention, offering support with staff wellbeing and helping individuals’ career growth – all of these aspects of the role require human skills. Consider what you can do to support the development of these skills within your HR team; after all, these human traits may actually become even more important as the use of technology increases. In short, look at how you can offer opportunities for people to up skill and retrain in areas that are not at risk of being replaced by AI. Change is coming and it is likely to affect us all – but perhaps HR teams especially. These are the people who are responsible for delivering the reward and recognition programmes that are so critical to maintaining a motivated and engaged workforce. With the threat of an AI uprising on the horizon, these may be the very people who are most at need of some reward and recognition themselves. Download our free e-Book and find out how a reward and recognition scheme could work for your organisation.